As with most interesting questions, there actually no easy solution. While the answers in Michigan now tend toward C., the best correct response is the old standby answer D. “All of the above.” School funding in Michigan is so complex that even our political and economic leaders often fail to understand it. For a more clarity we need to look at where the money comes from, where it goes, and how the system has changed. The best place to begin is the system Michigan used to use to fund schools (and the one that many people think continues to this day). Until 1994, most school funding came from local property taxes in amounts that depended on how much a school district could get voters to approve. This allowed for local control, but it also allowed high inequality. In the early 1990’s, the state legislature responded to concerns about high property taxes by simply eliminating property taxes as a source of school funding. The legislature gave voters a choice between a ballot initiative called Proposition A based largely on sales taxes and a “statutory alternative” based on income and business taxes that would come into effect if Proposition A failed. Voters approved Proposition A by 69% in part because it responded both to those who thought property taxes were too high and those who sought more equal funding for schools. But in appealing to many different groups the proposition created a very complex funding system. Sales taxes and other state taxes. Proposition A took most school revenue from state sales tax (including a 2% increase imposed by Proposition A), state income tax and a combination of smaller state-wide sources including the lottery and cigarette taxes. Local property taxes on non-homestead property. 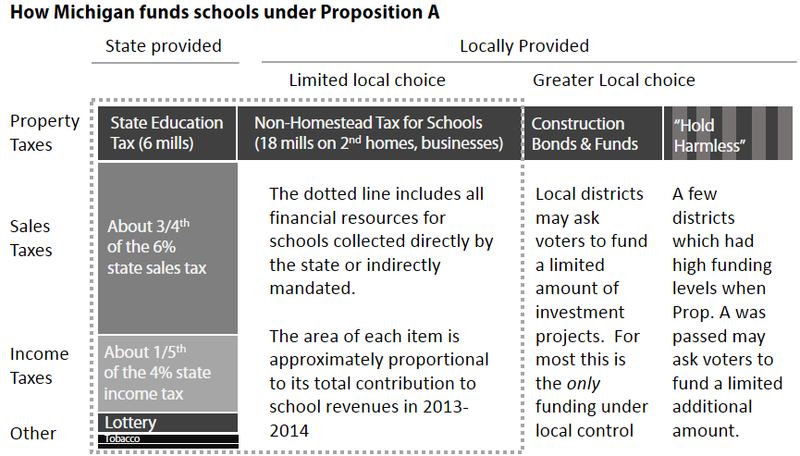 Proposition A did not eliminate school taxes on second homes, rentals or commercial property (“non-homestead”), but limited school taxes on these to an 18 mill maximum. Responsibility for collecting these taxes lies stay with the localities, and school districts must from time to time renew the millage by citizen vote, though no district in the state have rejected a levy in this category. Local homestead property taxes are still in the picture, but only in limited ways. Proposition A allows any district to pass a local property tax referendum for bonds or “Sink-ng funds” for capital investment including construction, renovation and technology, but the amount is limited by a state regulations. For most districts, this is the only way to add revenue beyond what is pro-vided by the state. (Some other districts are classified as “hold harmless” because they had higher per pupil funding when Prop. A came into effect. These districts may ask voters to approve additional operating millages. Ferndale is not one of those districts). Most school funding comes to school districts in a fixed amount per student, the “per pupil” or “foundation” allowance. Ferndale’s per-pupil allowance for 2013-14 is $7,758. This money follows the student, so lower enrollment means less revenues. The allowances differ in part according to the amount that a school districts was spending when Proposition A came into effect in 1994, but the law imposed minimum and maximum for state per-pupil funding. Funding rose for schools at the bottom and most schools at the top used the “Hold Harmless” provision to keep their spending high. Over time the minimum level has moved slowly upward, bringing schools with it, while “hold harmless” levels increase only at the rate of inflation. Ferndale’s $7,758 is above the current minimum of $7,026 (Madison Heights, for example) but below the maximum per pupil of funding of $8,049 (Avondale schools, for example) and far below the levels reached by “hold-harmless” schools with millages that are as high as $11,854 (Bloomfield Hills). The per-pupil allowance accounts for most Michigan school funding, but districts receive funds from other sources which reward districts for adopting specific practices and provide support for school lunches, school readiness, “at-risk” students. Many of these so-called “categorical” grants operate under very specific spending guidelines and attempt to deal with the fact that per-pupil education costs are not the same for all students (and are often highest in districts with the minimum allowances established in Proposition A). Here the clear answer is C. While there has been considerable disagreement over the adequacy of school funding, it is difficult to find any experts who do not see a recent clear decline in school funding in Michigan (except for a few who accidentally or intentionally ignore the effects of inflation). As the graph shows, the per pupil funding level adjusted for inflation has fallen by over 15% from its peak. Per-pupil funding is not the only source of school funding, but none of the other sources have increased to compensate for the loss. Since individual school districts are now increasingly liable for pension costs and face health care costs that are rising faster than inflation, the actual change over time is even greater. Kevin Deegan-Krause as a faculty member in the Political Science department at Wayne State University and was elected to the Ferndale School Board in November 2012. This article appeared in the November/December 2013 issue of Ferndale Friends.